The Bible tells us that we are created unto good works. We are light that should not be hidden. Men don’t keep lamp under the bushel, but on a table to give light. Men must see our good works and give glory to God our father in heaven. We are even to provoke one another to love and good works. In Acts 9:36, the bible talks about Dorcas, how she did good works to the extent that when she died; the brethren could not let her go like that. For some of us here, there may not be any reason for brethren to petition heaven for your return if you should pass away. For Dorcas, it wasn’t so. They didn’t let her go like that. What is impact? It is your ability to make use of the potentials, the gifts, the abilities and talents that God has given you to rule your world and make a difference in your generation. God does not create nonentities. Every one of us is born and loaded with potentials to make a difference wherever God has planted you. But your abilities to make use of those potentials determines the impact you can make in your generation. Many live and they die without impacting even a fly; does it mean that God didn’t bless them with anything? No! Just that they carry all that potentials into the grave. Some of us are carrying books, songs and lots of good works. Things that God expect us to do and bless our generation. How will you be remembered when you are no more here? That is why the bible says ‘whatsoever your hands find to do, do it with all your might, for there is no work in the grave where you go’. There is a time frame to work, Jesus even said He must work the works of Him that sent Him, while it is the day, the night soon comes when no man can work. Life is not about how long you have lived, but what donations you have made. Not to live as Methuselah and we can’t lay hold of a few things you have done. You don’t want to walk into heaven from the backyard, and no one would notice when you arrived. Someone like apostle Paul couldn’t have walked into heaven unnoticed. There must be a heavy celebration that a general has arrived. That is what we should aim for. How can you make an impact on your generation? 1. You must be a genuine and authentic child of God. You need to be born again so that the devil will know that he cannot devour you. You must be on fire, so he doesn’t joke with you. You must truly be converted. 2. You must be a person of integrity. Your salvation must show in the way you relate with God and people. Transparency, honesty, no hypocrisy. Let your moderation be known by all men. Let your Christianity not only be in your heart but in the things you do as well (Psalm 24:2-3; 15:1-5). 3. Be a broken vessel. Die to the flesh, carnality. Some people are crying to God to use them, but they are not usable because they are so active in the flesh (Rom. 8:8; John 12:24; 2 Tim. 2:19-22). You determine what can of vessel you want to be in God’s hand by your level of submission to His purging. (Gal. 5:16; Rom. 8:5-10). 4. Move your prayer life to another level. Some of us just like 2-3 minutes prayers. James 5:16 tells us how to pray. There must be fervency out of a righteous heart – Acts 4:31. It is a must for success and breakthrough. It must be done without season (I Thes. 5:17). You must have fellowship with the Holy Spirit to pray aright and well (Rom. 8:26). Fall in love with the Holy Spirit. 5. Load your spirit man with the word of God. It is the greatest tool for impacting others (Psalm 107:20). It has what it takes to heal and deliver. Paul encouraged the Colossian church to have the word dwell in them richly (Col. 3:16). You can be listening to the word in various form through technology. 6. Be a hardworking believer. Don’t be satisfied with complacency (Prov. 22:29). Avoid time wasters. Hard work put you in a class where few achievers belong to. It stands you out. Put you above average. Every level of success carries a price tag. 7. Watch the words that come out from your mouth. Words are powerful (Prov. 18:21). What do you say about yourself, your future and your destiny? Prov 12:18. No idle words in the realm of the spirit. 8. Be a great blessing. Add value to life (Gen 12:2). God is not looking for containers that will sit on His blessings, but stewards, channels and vessels. God can only bless you at the level of your capacity to be a blessing. Look for the opportunity to add value to people (Prov 11:24). Your worth in life is not what you have, but how many lives are blessed through you. That’s what is very special about the life of Job (Job 29:11). How many are smiling because of you? Don’t be an individual, you can be an institution. Don’t just look for money, seek ways to use what you have in impacting lives. 9. Be a solution wherever you find yourself. Some of us are so good to bring problems. James 3:16. You are either solving problems or you are creating them. Seek opportunities to solve them. What space are you occupying? Let your absence be felt when you are not there because your presence matters. Jesus always changes the atmosphere wherever He went (Acts 10:38). 10. Accept responsibilities wherever you find yourself and serve there joyfully. Ministry is about service. It is what brings out the greatness in you. Don’t shy away from it. 11. Be conscious of the company you keep. Don’t hang out with the wrong people (Prov 13:20). Who are your friends? Your association determines your destination (I Cor. 15:23). There are people who can become fire extinguishers of your life. Who are you hanging out with? Not every friend is meant for every chapter of the book of your life. It is wisdom to know when you are done with any relationship. 12. Enjoy your life. So that your joy can flow to other. The Kingdom of God is righteousness, peace and joy in the Holy Ghost. Have fun in your relationship with God and people. There is no spirituality in frowning (John 15:11; Psalm 16:11). Why frown when you can smile. It is also a seed that you can see the result straightaway in the life of whom it is sown. Be excited about your life, you will excite others. Enjoy the ride to heaven. 13. Be God’s priest in the marketplace. The church is a training ground. The world out there is our stage to practice (Rev. 1:5-6). You are a mobile altar of God. Your presence can change the atmosphere wherever you are. Don’t walk with your shoulders bent. Walk as the ambassador of Christ. You are God’s voice. 14. Be passionate about your mandate in life. It’s good to come to church, but is your place in the church? What is your place in the world? That is why you were born. Jesus knew of His (Luke 4:18; I John 3:8). Why are you here? What are you doing about it? 15. Be a change agent to your family or anywhere you are. Reverse evil trend in your generation. The daughters of Zelophehad change in Israelites history. You can do the same where you are. What change are you bringing where God has planted you? 16. Showcase the power of God. You can’t do that if you don’t have the fire of God in your bones. Don’t be an ice-condition Christian. It will solve most of your spiritual battles. It is still for today and not just for the apostles. Our world is waiting for signs and wonders (Acts 4:16). Wake up and let your life count. 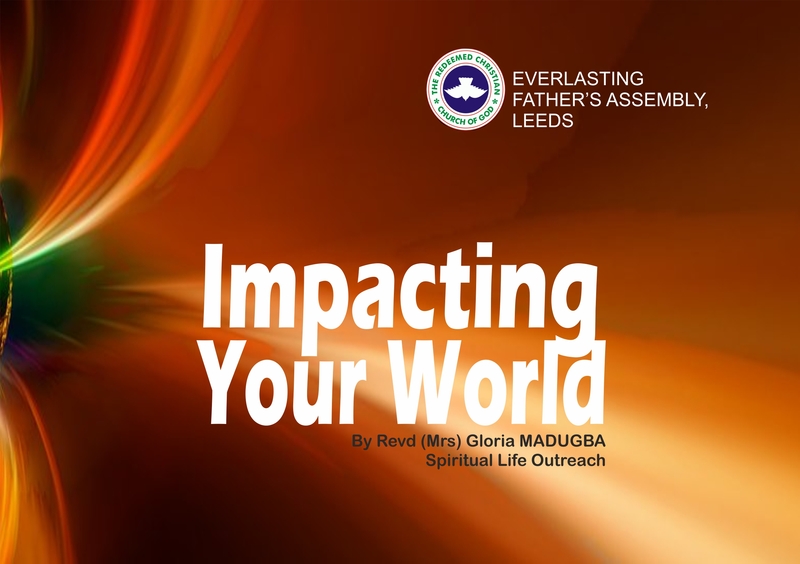 The sermon Impacting Your World was delivered by Pastor (Mrs) Gloria Madugba, Spiritual Life Outreach, Nigeria on October 28, 2018.